This bilingual site effectively encourages exploration and features rich, deep social media integration. We utilised a comprehensive planning and delivery approach which incorporated key design principles and addressed interactive feature requirements. This strategic approach informed usability, navigation, information architecture and feature development. 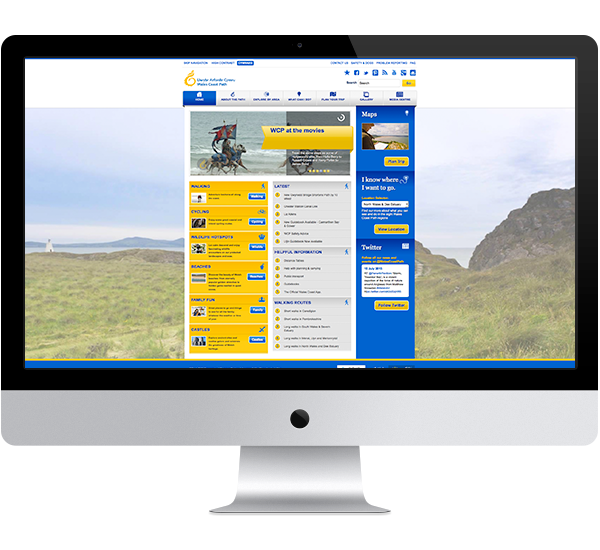 A blend of high-impact visuals, mapping technology and a sophisticated content management system has helped to bring the Wales Coast Path alive on digital. The site uses multiple templates to display important and relevant information to the user – presenting a streamlined user experience. 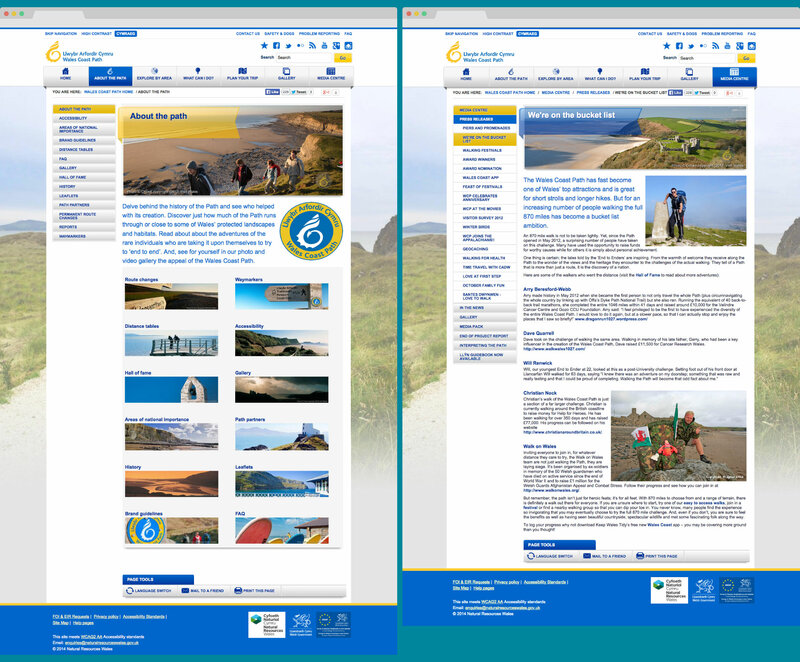 The homepage pulls in featured content, presenting the user with a number of quick-link features that allow for simplistic one-page navigation. Each subsequent sub-page deploys an alternative layout, with sub-navigation displayed prominently. Main content, additional links and contact information complete the experience. 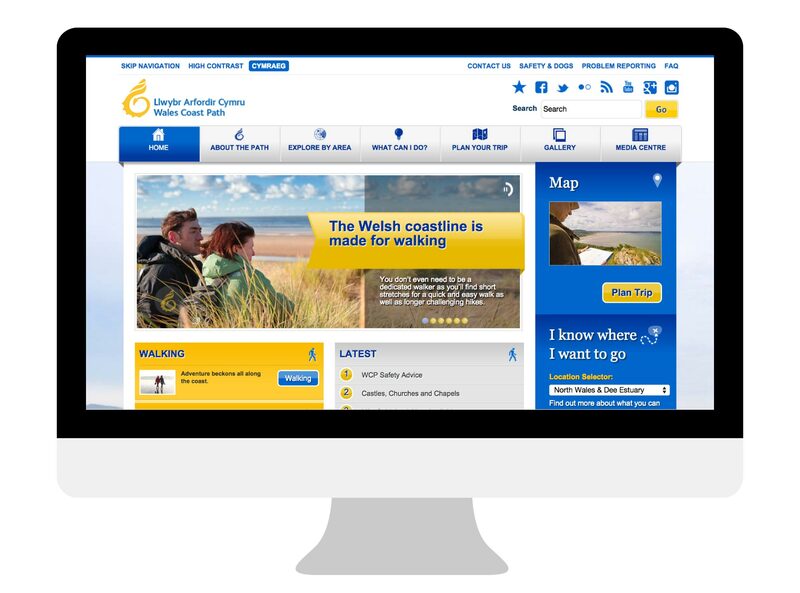 The colour palette reflects the vibrant branding of the Wales Coast Path. Primary blue and gold have been adapted to create the basis of the scheme. These colours can also be adapted and modified when needed. A default grey was used for copy and navigational backgrounds. Tints are used in conjunction with CSS3 gradients in order to add context and depth to graphics. We also developed a selection of responsive icons in order to illustrate sections on the site. The icons were designed to maintain core values, branding and to allow for unified accessibility.